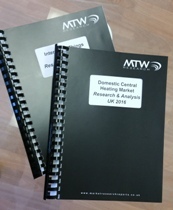 MTW Research are a publisher of high quality, market research reports in UK Building Products Markets, Home Improvement & DIY Markets, Construction Industry and Environmental Markets. Offering excellent value for money, our easy to reference and digest reports are researched and compiled by experienced and qualified marketing professionals who have experience of researching these markets for almost 2 decades. Unlike most other report publishers, our unique reports provide both quantitative data and qualitative comment to offer insightful and reliable market intelligence with good confidence levels from a statistically representative sample..
MTW Research Research & Analysis reports are typically around 150-250 pages in length, providing detailed market and product size and trend information. Our reports are both quantitative and qualitative in nature and are primarily aimed at manufacturers, importers, distributors, contractors and other suppliers to the UK DIY, Construction and Home Improvement markets, though are also read and used by consultancy companies, marketing agencies, other market research companies, financial institutions and a range of other companies both in the UK and abroad. Can't see the Market You're Looking for?